Monero Wins Resistance 15% Donation Contest! 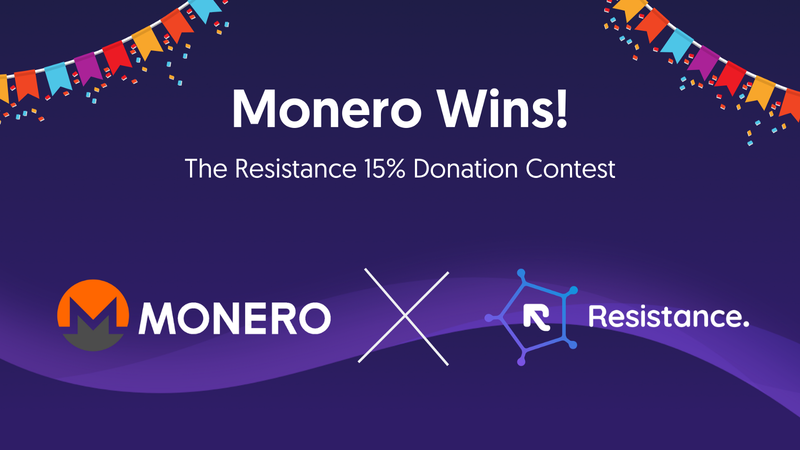 The Resistance team is thrilled to announce that Monero has won the ResDex 15% Donation Program competition! After the Resistance Mainnet goes live, 15% of all exchange fees accrued on the ResDex Exchange will be allocated to supporting Monero’s latest developments over the course of six months. It will be up to Monero’s development team to decide how they will invest the funds into their project. The ResDEX Donation Program is a way for us to help the greater privacy space through a funding pledge, and to bring to light the main cause that connects privacy projects together. That is, the freedom to conduct private, secure, and censorship-resistant transfers on a global scale. We look forward to supporting all privacy-centric projects in the near future, so stay tuned for updates. In closing, Resistance would like to thank each and every one of the projects and communities that were involved in this contest. That includes Grin, ZCoin, Beam, Cloak, NavCoin, Loki, and Bulwark. We look forward to learning about the incredible work these projects will continue to do in the privacy space.